The icon of the Bridegroom of the Church, which shows our Lord with a crown of thorns, is the most loving and sympathetic icon for every Christian, even those who are hurting. Those who hurt find rest near the one who hurts.The wounded find comfort in one who has more wounds, because they is in a position to understand him. The unjustly accused remains stable in their despair, when they gaze with their physical eyes on someone else who has been dragged and unjustly accused. Exactly the same thing happens with every person in need. The sad, humiliated and bloodied face of our Lord attracts every person who has problems and is facing trials. 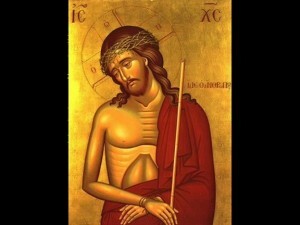 He is wronged and persecuted by the wickedness of people. One is calm, when they see with their physical eyes the icon of our Lord or embrace Him with warm faith, when they think that they as people perhaps are to blame prior to being convicted, while our Lord was sentenced without doing even a small error. Nevertheless people like bandits arrested and crucified Him as a villain, while I have not managed to live one day without committing some fault, without expressing a bitter and inappropriate word, without thinking something evil or harmful for my soul. Sinners, when they see the crown of thorns of our Lord, are comforted and hope enlarges within them, that they will be redeemed from their passions and saved from their sins, since our Christ by His undeniable crucified love was sacrificed “for us and instead of us”. And generally everyone facing trials, seeing and trusting that they have a sympathetic and fellow-struggling Lord, take boldness and courage, forget their pain, they are not crushed by the millstones of their trials and they live with the hope of their salvation and their deliverance from the bitterness of this life. Hopefully every person will realize, that in life they do not fight alone. The Bridegroom of the Church loves our soul His bride and wants to always be near her “going to bed together and rising together”. The hurting Christian, the much-suffering family man, the youth tried daily, the sick who suffer, the sinner tormented either by the guilt of thoughts or the abandonment of loved ones, let them bear in mind that in their struggles and distress, in their defeats and victories, in their joys and sorrows, the Lord is before them, the Bridegroom of the Church, who, according to the good teaching of the sacred Chrysostom, is all things to us.